The study trip to Istria, which included a visit to one of the most famous wineries Kozlović, followed by Zigante restaurant, AZZRI workshop, the recently awarded Michelin star restaurant Monte, VInistra and finally an OPG (family farm), the students returned satisfied and full of impressions. Although the travel plan promised many things from the very beginning, they were left delighted with new experiences. Impressions started to coincide from the beginning with the visit to the winery Kozlović, one of the most modern wineries in Europe. They were hosted by the program manager and had wine education, where they had a warm welcome in the winery as well as a tasting workshop for tasting four types of wine. They tasted their best wines like Terana and Momian muscat desert wine. The students had the opportunity to see the whole winery and see all the processes in wine production, such as the way it is processed and the entire technological process of wine making. Wine storage is also of great importance, so they were explained and demonstrated in which kinds of barrels they hold wine in order to preserve the quality. After the exceptionally high quality and interesting tastings in Kozlović, the journey continued to Livada, at restaurant Zigante which is one of the best Croatian restaurants. The students were very kindly welcomed by Chef Damir Modrušan who prepared a dinner and impressed all of the Gastronomy students. With a few courses of prepared meals, where most of them were with truffles, they served wines that were perfectly suited with the dishes. A special experience was the staff of the entire restaurant, their professionalism and expertise. Chef Damir Modrušan gave the students a motivational lecture and encouraged them to work and practice. 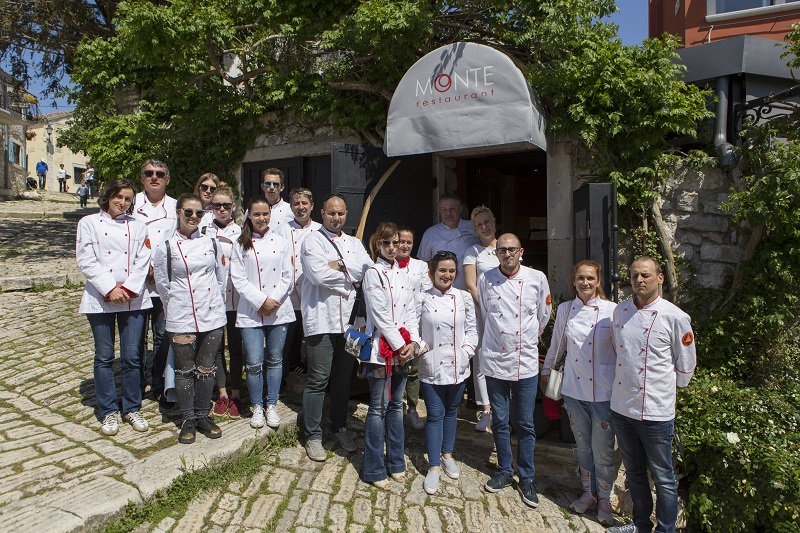 The next part of the trip was reserved for Pazin because a workshop was held in AZRI (Istria Development Agency) and the Istrian Gastronomy Center with mentor masterchef Denis Galić. The workshop was on the topic of Istrian boscarin –Istrian bull from which they made their dishes. The interesting thing about the Istrian boscarin is that every restaurant in its offer must first get approval from AZRI to include it in their offer, which restaurants and hotel holders of the certificate are very proud of. Mr. Edmond Šuran, senior expert advisor and head of the Gastronomic Center, also gave a motivational lecture to the students about the way they started the whole project and how they were devoted to Family Farms and original indigenous foods in Istria. The goal was to enrich the slightly forgotten foods and implement them into restaurants and hotels. The students eagerly wanted to visit the first Croatian restaurant with a Michelin star. The restaurant owners, Tjiska and Danijel Đekić, showed the whole restaurant to the students and with a complimentary welcome drink, they mingled with the students. He talked about their vision and gave them tips and suggestions for future business ideas. The story of the success of their restaurant, which is now known to all gourmet lovers, was presented to them in a very simple way. Given that they were aware of how much work goes into achieving the success the restaurant had before the star, they were especially impressed by the immanence and ease with which it was explained. At the time, as scheduled, Poreč held the 24th in a row Vinistra. The students had a nice welcome and participated in an important sommelier event. At Vinistra they saw and met many famous people from the area of gastronomy and cooking and socialized with them while tasting the best Istrian wines that decorate the enological map of Istria. After Vinistra, they went to Jadruha to a Family farm for the end, where they were greeted with a dinner prepared with autochthonous food from their own production. There were plates with delicious autochthonous products, such as Istrian prosciutto, Istrian baked meat and sausages, and sausages with truffles and game meat which especially impressed them. After the appetizer, a dish was prepared with old traditional recipes – boscarin in sauce with gnocchi and homemade pasta with asparagus, and at the end delicious cakes prepared from their products. After a beautiful and quality couple of days and a handful of impressions after every day, it was time to return home and back to their student responsibilities.